Robotic system puts more cars in less space. 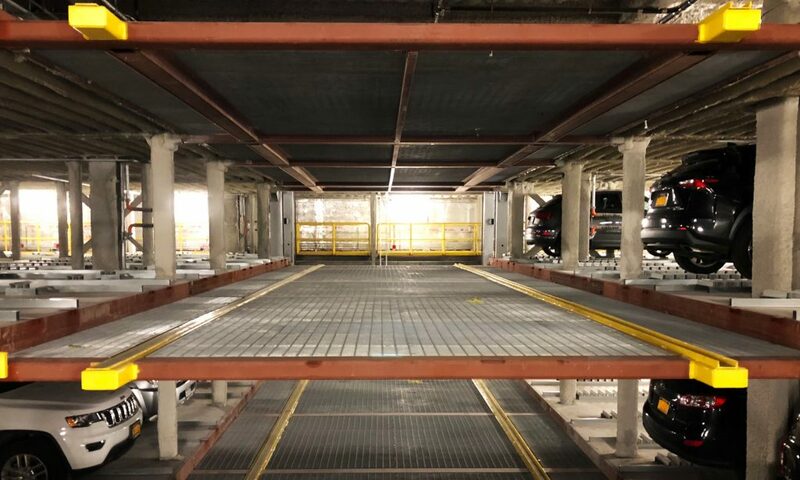 In the heart of New York City, where street parking is virtually impossible a new, state-of-the-art automated parking structure is storing more cars in less space and less time. It’s also eliminating some parking lot accidents. The new facility, opened last month, was designed and built by PARKPLUS and is the largest automated parking system in Manhattan. It offers robotically operated parking and retrieval for patients and visitors of a large hospital complex on the east side of Manhattan. The system is set up as Valet parking, but humans only perform a small portion of the process. Visitors hand their keys to a valet who drives it into the loading bay and at that point, the automated system takes over. The robotic transfer device, a low profile handling mechanism (dolly), travels below vehicles and moves them onto a shuttle that travels the fixed-rail system. The shuttle travels on a lift to one of the four upper floors of parking and transfers the car horizontally to a pre-determined stall, where the dolly unloads the car. Integrated software records all transactions and allows for remote monitoring for improved system performance and enhanced user experience. Vehicles can be parked in tandem up to 3-deep, and the system will automatically shuffle vehicles as needed. Retrieving the car is simply the same process in reverse, and takes only about 90 seconds in most cases. Additionally, it’s integrated with the hospital’s information system, so users will find computer pads throughout the hospital where they can pay for parking and initiate retrieval. The car can be brought down while the driver is still on his or her way to the parking structure, and is waiting when they arrive at the valet desk. The parking system is contained within the walls of the hospital building. There is no “garage building” visible from the street. Systems of this type can also be built as free-standing structures and can have an architectural facade applied to suit the surroundings. The hospital’s valet set-up is an appropriate amenity, but robotic parking systems are user-friendly enough that they can be operated without human valets. PARKPLUS has installed robotic parking in residential buildings where the entire parking process is handled automatically and enabled with a mobile phone app. Drivers retrieve their cars by requesting them from the app, which works from anywhere via Internet, and can even schedule a vehicle retrieval time in advance.